American Revolution – How America Overturned Monarchy and Became Independent, Rich, and Powerful? Have you ever wondered what is the significance of the American Revolution? The main significance is that the war ended the “Divine Right of Kingship”. America overturned Monarchy (rule by kings) and it became a Republic (head of the state is not hereditary). And finally, America became the United States of America, the richest and powerful nation in the modern world. The British crown had different colonies all over the world – in Asia, Africa, and America. 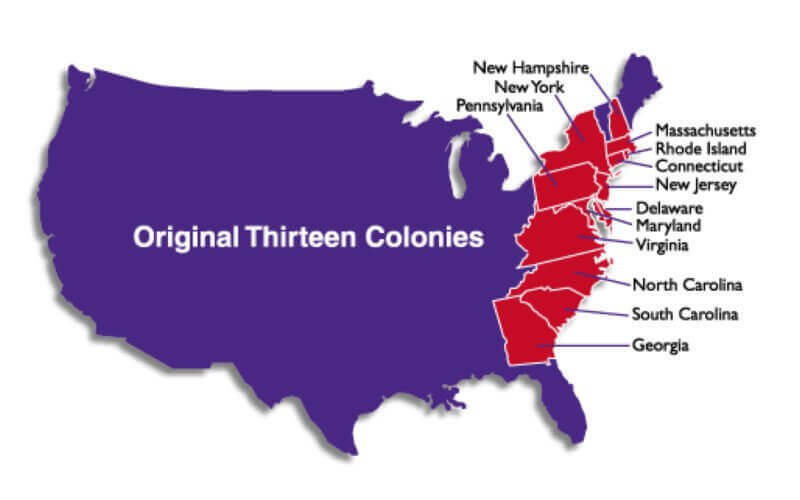 By AD 1770’s, there were 13 colonies of Great Britain in North America. The colonial government was represented by the British crown (King George III). Tensions grew over time between the residents of Great Britain’s 13 North American colonies and the colonial government, which resulted in a full-fledged war by 1775. The American residents fought against the British by making an alliance with France. Americans defeated the British in the American Revolutionary War, thus becoming the United States of America. A Little History of the American Continent – How did Britain start ruling Americas? Before 1492, the entire focus of history was limited to the old world. It contained the whole of the world’s landmass without the Americas. There is no land route available to the New World. So it remained isolated from the major cultures and civilisations of the old world. 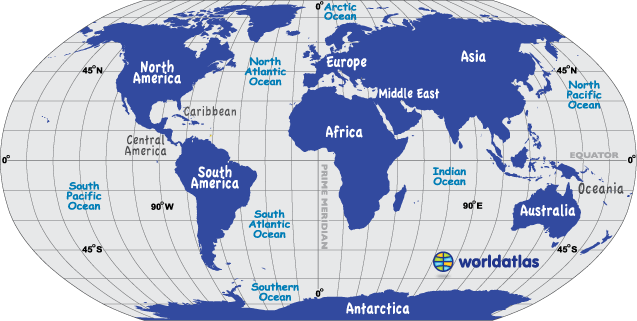 This changed when the sea route to America was discovered by Christopher Columbus in 1492. After that, various European powers established colonies in North America, prominent among them being Spain, Holland, France and England. The colonies were populated mainly by European migrants who were landless peasants, people facing religious persecution, traders, explorers, and others seeking adventure and profit in these new found lands. There were constant clashes between the hegemonic powers to establish control over as much land as possible and control trade supply lines. Since these powers were locked in conflicts across the globe, a new theatre of war was inaugurated in the Americas. The rivalry was especially strong between England and France, which culminated in the seven years war (1756-63). It is known as the “first true world war” and was fought in Europe, West Africa, the Americas, India and the Philippines. The war concluded with the Battle of Wandiwash (1760) with the decisive British victory. This ushered in an era of British supremacy across the globe. In North America, Britain consolidated all colonies lining the Atlantic coast and drove the French out of Canada. She was also successful in taking many Dutch territories, most important being New Netherlands, renaming it to New York. The colonies of England lined the Atlantic coast and were thirteen in number. The colonies had a diverse population, but the majority of them were independent farmers. With time, new industries were set up producing wool, flax and leather, mostly for European markets. However, the nature of economies was varied within them. Fishing, shipbuilding, and allied industries grew in the north while plantation agriculture thrived in the south. Later, the divide grew into the north industrializing further and the south lapsing into a feudal economy powered by slaves brought from Africa. (You may note that this divide later led to the American civil war (1861-65) as well). Politically, the colonies were governed by a locally elected assembly. They enacted laws and levied taxes. Though they enjoyed some independence, they were ultimately answerable to the mother country (Britain). Though Britan was ruled by the Parliament, secondary treatment was meted out to the people of America. This led to widespread discontentment and provided a fertile ground for rebel ideas to grow and prosper. The ideas from the age of enlightenment influenced the Americans profoundly and the idea of staying as an independent nation gained traction. There were various Political, Economical and Ideological reasons that led to the growth of discontentment that led to the American war of independence. No Representatives of Colonies in the British Parliament – The colonies were given no representation in the British parliament. Resource draining of the colonies – The seven years war (1756-63), though ended in the British victory, had drained her resources. She turned to colonies to offset the losses. Since the major colonies were in North America, they suffered the most. The fledgeling industries of the colonies were especially penalised. This was under the lobbying of native industrialists in Britain. 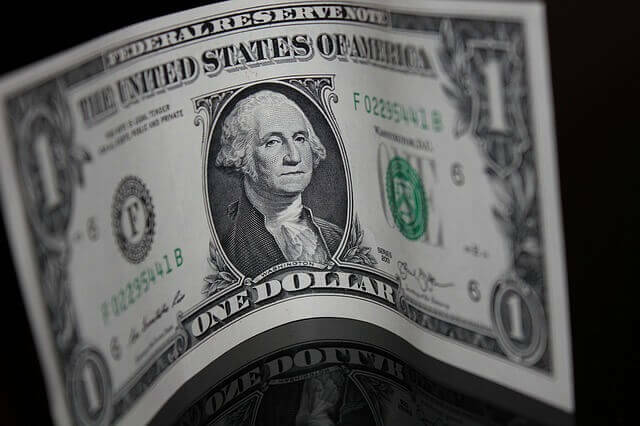 Taxation without representation – since the colonies were not represented in the British parliament, many people asserted that the British government had no rights to tax the colonies. They used the slogan ‘No Taxation without Representation’. Protests – Through protests like Boston Tea Party (1773), where tea cartons carried by British ships were thrown at the sea, Britain’s right to levy taxes was eroded over time. This power was assumed by respective local governments. England’s policies prevented the economic development of colonies. Laws were enacted that mandated them to use only British ships for international trade. Export limitations – products like tobacco, sugar and cotton could only be exported to England. Heavy import duties for products from other colonies and outside England. Restrictions on Industrialisation – development of industries like iron, steel and textiles were prohibited in the colonies. Goods from England were forced upon the colonies. Policies were adopted to impede the growth of industries and commerce in the colonies. Stamp duty – In 1765, the British Parliament enacted the Stamp Act. It was made mandatory to affix stamps on every legal document. This led to widespread protest, many of them turning violent. Rent – The aristocrats from England bought most of the land in North America and prohibited land ownership rights of the colonisers in the west. They wanted to keep the colonisers as rentiers for perpetuity. The British attempts to levy taxes were resisted. Upon on objection, Britain was forced to withdraw most taxes except that for the tea. This led to protests like Boston Tea Party (see below). Since the British parliament had no representation from the colonies, it was held that it had no right to tax the colonies. This was deemed seditious by the British but didn’t deter the colonists. The enlightenment philosophers like Locke, Harrington and Milton caught popular imagination. They believed that all people had certain inalienable rights that no government should be allowed to infringe. This was in direct contrast with the oppressive British rule. Inequalities of British society was despised by many philosophers like Thomas Paine and Thomas Jefferson. They asserted the right to rebellion and emphasised on the absurdity of a continent being governed by an island. The representatives of 13 colonies met at Philadelphia (1774) for the first continental congress. Their appeal for just treatment was rejected by the king and their actions declared as mutiny. The War started in 1775 with colonial militias clashing against British troops for the first time. 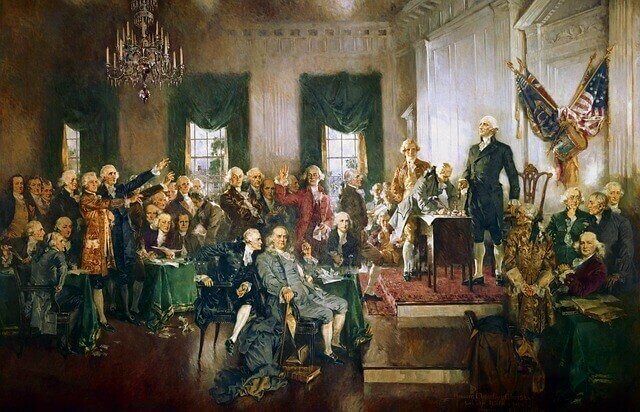 The congress met again in Second continental congress (1776) and declared independence on July 4. The declaration, among other things, asserted the inalienable rights of men that had to be protected. This was later elaborated in the Bill of rights. Indian constitution adopted fundamental rights from the Bill of rights of the USA. People were seen as the source of authority. This would pave way for the first modern democratic state with a written constitution. The Americans were aided by the French, who were looking for an opportunity to strike at Britain. The trouble brewing at home (Irish rebellion) also made things difficult for the British. Other enemies of the British like Spain and Holland also started fighting them at different locations of the continent. War ended with English commander Lord Cornwallis surrendering to George Washington in 1781. The treaty of Paris was signed in 1783 between England and USA which formally brought an end to the war. The revolution led to the establishment of a republic based on the first written constitution in the world. This was a marked contrast to the other states were Monarchies were still in power. This inspired people across the world to struggle for democratic and republican forms of government. It established a federal state with powers divided between the federal government and states. This provided a nice template for power-sharing in diverse countries that needed complex polities. Besides, there was a separation of powers between various organs of the state. Certain inalienable rights were given to the people – this limited the government against the authority of people and reduced government interference in their lives. Democracy was established, but it was far from perfect. Sections like Negroes and women were denied voting rights. But the journey to democracy had begun. It led to many uprisings in Europe, with the French revolution being the biggest. Many generals who participated in the war was instrumental in the French revolution. Thinkers like Thomas Paine also participated in the revolution. This led to a spread of modern ideas in Europe. The American revolution had a profound impact on the history of the modern world. It provided a template through which modern ideas could defeat oppressive regimes. The subsequent success of the USA in world arena is a testimony to how powerful is the idea of liberal democracy and emancipation of the populace. This model was successfully emulated by many countries (especially in Europe) post World War II. India also has learned a lot from the American experience and adopted many of these democratic principles, adding to our own democratic socialist principles. Relevant topic for UPSC. 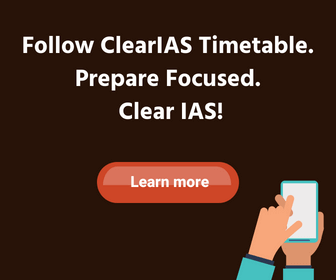 I CLEARIAS would continue their efforts to help the aspirants. 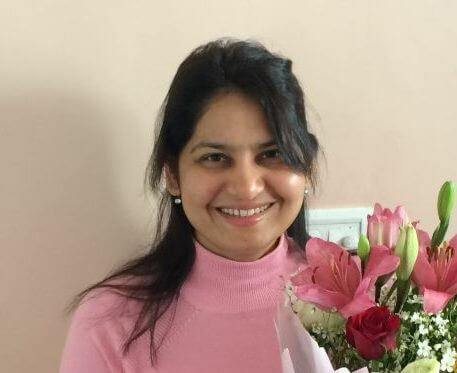 very helpful and knowledgeable …..is this article relevant for UPSC ?